In this episode of The Elite Advisor Blueprint, Mark Moses (@CEOCoachMark) is here to talk about how to define, measure and accomplish any goal as a financial advisor so you can take your business to the next level! 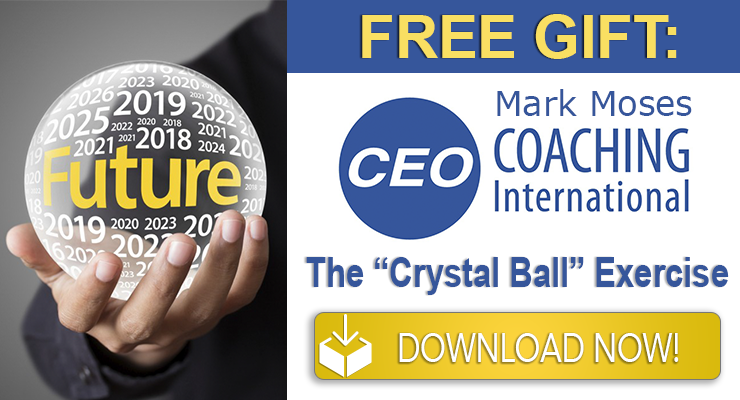 Mark is a founding partner at CEO Coaching International, where he and his team help businesses and individuals increase profitability, drive margin expansion and gain accountability in order to meet business objectives and reach new heights. Mark started his first company when he was 19 years old and graduated with a business degree from Wilfrid Laurier University in 1987. Since then, he has successfully built and sold two companies: Student Painters and Platinum Capital Group. Mark’s new book, Make Big Happen: How to Live, Work, and Give Big, teaches you to ask better questions, so you can get better results. The questions outlined in the book are the foundation of every fast-growing profitable business and answering them in the right way can lead to exceptional results. In this interview, Mark shares his inspiring entrepreneurial journey and the invaluable lessons he’s learned along the way. He discusses the importance of finding great mentors, ways for staying accountable so you can achieve BIG goals, his proven methods for building an unstoppable sales force, prioritizing what matters the most and the power of believing in yourself. He also shares a lot more more incredibly insightful advice and actionable takeaways that will allow you to get what you want so you can take your financial business to the next level. Richard Branson – Founder of Virgin Group Ltd.
Warren Buffett – Chairman and CEO of Berkshire Hathaway Inc.
[0:03:01] Brad: Welcome to the Elite Advisor Blueprint Podcast. This show, we have the tremendous privilege to have Mark Moses, CEO of CEO Coaching International, so that flows really nicely. So welcome to the show, Mark. [0:03:16] Brad: Well, it’s fun to see where my guests come from. And one of my very first guests and one of the people that I have a tremendous amount of respect for in our industry is a guy named Ron Carson, who’s a mutual friend, and so he connected us. At this point, you’ve run some tremendously successful businesses as an entrepreneur. They were so successfully sold in other people. And now, you’re coaching other CEOs on how to grow their business. So can you give the listeners here that might not be familiar with you, might not be familiar with your company, just a little bit of background on who you are and how you came to be where you are today? [0:03:52] Mark: Sure. So speaking of Ron Carson, we just did a great event together. I think you were considering joining us for, I think Ron mentioned you weren’t trained up enough for it. But ti was the Rim-to-Rim-to-Rim in the Grand Canyon, 48 miles, round trip, 25,000 feet in elevation change. It was an amazing experience. Maybe you’ll just us next time but got to share that experience with Ron. It was great fun. [0:04:19] Brad: So now, you’ve set the tone for this conversation. I see how it’s going to go. All right. [0:04:23] Mark: Yeah. This is just the beginning. [0:04:25] Brad: I think I could keep up with Ron. I don’t know about you, man. 12 triathlons under your belt. Is it still 12 or have you added some more? [0:04:32] Mark: No, it’s still 12. But I just got back from doing the Polar Circle Marathon in Greenland, just above the Arctic Circle. We ran on the Polar Ice Cap. The first six kilometers were in knee-deep snow. And we needed to wear chains on our running shoes. I finally dumped them after 25 kilometers because my feet were getting really heavy, got tired of them. And it was cold. It was -23 with 27 mile-an-hour wind. So it was quite an experience. So not a triathlon, but a couple of marathons this past year which were fun. But let me answer the question that you asked a moment ago, which was a little bit about my background. I grew up in Canada. My dad went bankrupt to my last year of high school. And I needed to make money to pay for college. So I’ve been a lifeguard. That wasn’t enough money to pay for college. So I started this business called “Student Painters.” It was a franchise program. And I hired some other students. I went and sold the jobs that we would to do to homeowners like you and me. They were in their 40s and 50s. I was 19 at the time and built this pretty cool little business, did $70,000 in business my first year, made $18,000, the second summer, made $35,000 on a $120,000 in revenue. And I thought, “Wow. This is amazing.” For that, going to college to become an accountant, I’m going to be an entrepreneur. So I graduated from college as a self-proclaimed, I guess, a guy that wanted to be an entrepreneur, packed my U-Haul, drove from the Toronto area in Canada to Southern California and opened up the company called “Student Painters.” We grew it from zero to 250 locations in four years, hired 3,000 people. And I sold the business when I was 26. After about a year then changed and I got bored. So I decided to set up a mortgage company. I felt qualified to set up a mortgage company because I had a mortgage. And we grew that over the years. We rode the ups and downs of the cyclical mortgage market. And it was an amazing journey, a lot of good times, some very, very challenging times, but built it to $1.6 billion in annual business. We have 550 employees in 65 offices around the US. And I sold it Friday the 13th of October 2006. And then, took about a year and a half or so off, maybe a little longer and started doing a little coaching of some entrepreneurs that needed help growing their business. It was just a little bit of a hobby at first. And finally was planning on doing it for a little while and I’m in my ninth year now of doing this. And today, we serve 130 CEOs and entrepreneurs in 12 countries around the world. [0:07:38] Brad: Quite the journey. What made you decide, “I’ve grown up in Canada my whole life-” I would assume, “-and I’m just going to hop to the US and start a company,” was it just a sense of adventure? What made you hop to the US? [0:07:49] Mark: Well, I grew up in a small town. So do you want the truth? [0:07:51] Brad: Yeah. Let’s hear it. [0:07:53] Mark: Well, the truth is warmer weather, that part’s easier, and better-looking women. So that’s the truth. [0:08:01] Brad: California, well, you got both of those, right? [0:08:03] Mark: When you grow up in a small town in Canada and you watch plenty of movies, like for example, “What’s Going on in the Valley?” or “Fast Times of Ridgemont High,” and I ended up marrying a valley girl from the San Fernando Valley. [0:08:16] Brad: There you go. Cool. So let’s go back to – because I know there’s a lot of lessons along the way – and just take one from young Mark Moses, just fresh out of college, starting up a college painting company. Let’s say, what was the biggest mistake you made. That’ll be a fun one at that age? [0:08:33] Mark: When I first got going, I was so obsessed with the opportunity of if I work hard, I could build something more, and more and more and more. And I was doing this as well in college. I was way more excited about what I was doing with my business than I was about college. And it’s all I thought about all my waking hours. I call it “18 hours a day.” I was obsessed. It was too much of a good thing. A doctor told me at one point that if I keep this up, I wouldn’t make it to 25 because I was way, way too intense and way over-the-top in how obsessed I was with my business. [0:09:20] Brad: How many hours a week were you putting in at that time? [0:09:23] Mark: Every hour that I was awake. [0:09:27] Mark: Weekends included. As a matter of fact, the weekends is when people were home and we sold all the jobs. I was the only sales guy. I sold all the jobs. I hired all the people. I dealt with all the problems. So as a learning, I learned that I could hire others to do some of the stuff that I was doing and that enabled me to have a better life and scale. Now, I wouldn’t say better life. At the time, I was 19/20 years old. It enabled me to achieve a whole bunch more. And I hired one of my roommates that was just a great guy that took care of a lot of the day-to-day operations of the business for me while I went out and sold more work. [0:10:10] Brad: So let’s take a lesson from your book. And actually, it just come out last year, 2016? [0:10:15] Mark: It did, February 9, 2016. [0:10:17] Brad: OK, “Make Big Happen.” And in the very beginning, it’s your business partner. What’s his name? [0:10:24] Brad: Yes, thank you. So Jack mentioned something that I thought was incredible that speaks to a little bit of your growth. And I’d love to dig in on where this came from. He mentioned that he’s an older gentleman than you. You met him at one of his, basically, conferences where he was teaching others. You were the guy that offered to take him out to dinner if I’m remembering the story right. And there’s another quote in your book that I love is, “If you’re the smartest guy in the room, go find another room.” So I just want to know where this all came about from. Did you have a natural curiosity? Was there a mentor that instilled that in you? Because I think that’s a big testament to your growth in business and going back to the delegation, how you’ve kind of evolved through your entrepreneurial career? And as that carried on, my first mentor started when I was 24. And he was a senior partner at Arthur Andersen, the accounting firm back then. And he was great. And then, when I started my next firm, he joined my board. And then another guy, another guy with white hair joined my board. And we had three white-haired guys on my board. And it’s not that they painted their hair white, they were just older. And I really liked the experience that they had. I really liked the way that they challenged me. They respectfully challenged me. But they would call me out when I needed to be called out when they thought that what I was trying to achieve might be unrealistic or when I was not being the best leader that I could be. And it really helped me with my leadership skills and get buy-in and alignment with my people to truly get what I wanted. It also inspired me to continue to hire better people, because I learned, too, that the people that got me to a certain point typically weren’t the people that would take a small business to a much bigger business. [0:13:06] Brad: How old were you at the time? [0:13:08] Mark: When I started Student Painters at college, I was 19. When I started Platinum, Platinum Capital, my mortgage company, I was 28. [0:13:18] Brad: And the board that you’re talking about was at Platinum Capital? [0:13:20] Mark: The board was at Platinum Capital, I was 28. That board started, I joined some group. The first group I joined was called “TEC” back then. But then it got renamed as “Vistage.” And the guy that became my business coach, a guy named Richard Curtin, was my Vistage Chair, and he went on to become CEO of the company, which stayed on my board and coached me personally for the next decade. He was a tough guy. I resonated really well with him but he wouldn’t put up with any of my nonsense. He was really good at calling me out on my stuff. He would really challenge me. And he would look at my plans and make calls in them. It was really good for me. He would also meet with some people on my leadership team that I was having challenges with either in their effectiveness, their accountability, doing what they said they would do, or whether they were the right people for the roles to take me where I wanted to go. Made a big difference having a second set of eyes that I truly believed and I still do. He always cared about me and wanted the best for me. And it made a huge difference. [0:14:32] Brad: It’s interesting as I’m listening to you. Well, question number four on your book, feel free to share this with the listeners that haven’t checked out the book your four questions but question number four is all about, “How do you hold yourself accountable on measure?” And that’s what you did, no different than if you want to get in shape, go find a great personal trainer. You found that for your business and guys that would call you out if you were slacking or not leading properly the way you should. [0:14:54] Mark: I love the accountability piece. It’s no different than the personal trainer. Look, I don’t need a personal trainer, but I was with my personal trainer this morning. I am highly disciplined. However, the personal trainer pushes me harder than I would push myself. And I love that accountability. And personal trainer causes you to show up. If you got the personal trainer in the calendar, you will be there. If you’re running with a buddy, you’ll show up to run because you’re not going to leave your buddy hanging by themselves, or you’re going out with a back ride with friends, you’ll show up for that because people are counting on you. So I think the accountability is really important. And I’ve learned coaching CEOs, learned at my own business, learned at coaching others, that if you really determine what it is that you want, how you can get there if you keep a scorecard and measure, I said, “I would do “x.” How did I do compared to how I said I would do?” Post it so you get to see it; the numbers don’t lie. And you can keep making excuses for yourself. “I didn’t do it because I didn’t make the number of calls I was supposed to make today. I’ll do it tomorrow.” Or, “I didn’t do it because I was sick today,” or “I didn’t do it because I got distracted by whatever,” a shiny new object. But at the end of a week or the end of the month, if you said you would do, let’s just call it 200 calls, and the number came in at 100, you’re going to miss your plan by likely 50%. [0:16:26] Brad: Well, so now I have to bust this quote out. I did some intel, so sent Ron Carson a text. And so he said I need to make sure that I talk to you about this quote here. He said one of your favorite quotes is, “What are you going to have to do to guarantee something will happen?” That sounds familiar? [0:16:44] Mark: It sounds like I know where this is going. [0:16:48] Brad: But just speak to that. That’s a no BS question, right? OK. You said you were going to do this. So that’s going right along the line here with the accountability that you’re talking about. Is there anything different about that question than what we’re talking about here? Is that just a different way of saying it? [0:17:03] Mark: No. It is different. And let me express that. In my book, I talk about four questions. And I’ll just state what they are. It’s very simplistic: number one, determine what it is that you want; Number two, how will you get what you want? And that’s what we’ll speak to about the guarantee question – number three, what’s going to get in the way? And number four, how do you hold yourself accountable? So let’s go back to question two: how do you get what you want? So I used to ask Ron, “Ron, what would it take to guarantee we make that happen?” And he didn’t like the word “guarantee” because he would say, “Well, nothing’s guaranteed.” And we’d have this debate. I said, “Ron, would you prefer I call it “hope” we get it done? “try” to get it done? You tell me which words you like and we’ll go wit4h whatever words you want. But I like the word “guarantee” because it’s a higher standard. It really gets you to think about what will it take to guarantee to get it done.” So for example, let’s go to prospect meetings. I know that if I do “x” amount of prospect meetings, that I would convert so many of those into clients, right? So in order to guarantee it, let’s say you needed to do in a month, let’s just call it 15 prospect meetings, so in order to guarantee it, guarantee that I might do 20. So you’d said the bar higher. So if you’re off a bit in your assumption, you can still guarantee the result. [0:18:35] Brad: Makes all the sense in the world. I do know why Ron shied away from guarantee. He’s a very compliant and suitability-minded person. And the word “guarantee” in financial services is a bad word, so that might have been why. I’m just going to give him an out. [0:18:59] Mark: Of mortgage volume, yeah. $1.6 billion mortgage volume. [0:19:02] Brad: A billion dollars of revenue would have been a lot cooler, right? OK. So let’s go with this because one of the things you shared with me that I thought was very cool that applies to obviously our audience, financial advisors, is you had a very successful model with training a sales team. It sounded to me almost like sales boot camp. And can you speak to your methodology? Just be down to how do you guarantee things when you were running a very systematized process to make sure guys were hitting their sales quotas. Can you speak to just high-level what that look like? [0:19:33] Mark: Yeah, so first of all, let me start with selection. In terms of selecting, we were hiring at one point about 20 people a week into our sales organization. And when you’re hiring that many people, it’s easy to make mistakes. So if you just hire people that are like you or people that you like, because they’re likable, you could easily make a mistake and get sold. So, first, we have a whole series of questions that we would ask that were a lot deeper questions with follow-on questions that would go deep to try and validate the information that we were asking. We would also use assessments to determine. We know that in commission sales, for example, you got to be highly-dominant if it’s a relationship sales. The majority of the people have a high week on the DiSC. We call it a “high eye.” They’re charming, persuasive, convincing. They know how to make a relationship sale. And we know somebody that’s a low dominance, for example, is more hesitant, cautious and will likely not be as successful. We also know that someone that’s motivated by return on their efforts, “I work hard. I get rewarded,” will be more successful. So we use that as part of our process to try to select the right people. Then, when they joined us, we have a rigorous training program. Then the training program involves training. At the beginning, it was four hours a day in the training room just learning about our product, product, how to sell our product, role play, role play, role play, all the time, every day. And in the afternoon – so that was the morning – in the afternoon, they would wire up the headset and listen to actual live calls by our top sales people. They listen, watch, observe and learn best practices. And then they practice them the next day in the training room. Now, people ask me all the time after they got out of the introductory period, how long do this training program go on? It went on forever every day, an hour a day because it helped our people be better. I remember this story. I live in Newport Beach, California. One day, several years ago, on Christmas day, people were talking about Tiger Woods being over at Big Canyon Country Club. And he would spend several hours in the sand trap practicing his bunker shots. If anybody – and this is Tiger Woods, number one in the world at that time – if anybody in the world could take Christmas Day off, it would have been the number one golfer in the world, but no, Tiger thought – and this is probably a little bit obsessive – but you have to be a bit obsessive to be number one in the world. He was in the bunker several hours practicing his bunker shots. Practice will make you better. [0:22:39] Brad: So let’s apply this to the world of financial advising. Most of those sales are going to be face to face, right? So how would you adapt this sales training for the financial advisor space? And my other curiosity, who is running the training for your teams or who should be running these type of trainings? [0:22:57] Mark: So we had trainers and our VP of sales, so we had product training and sales training. And every day, we would create a series of role plays to practice. So apply to the financial advisory space, let me take it all the way to the beginning of the funnel for a lot of firms who starts with lead generation. So let’s say we’re making calls. There’s a right way to make a call, say if it’s a cold call. Let’s say we’re calling off lists. There’s a right way to do it and there’s a wrong way to do it. There’s multiple different ways to do it. But there’s probably just a couple of “best practices” way of having the highest success. Jack Daly would say – Jack’s one of the top sales trainers in the world – would say, “The best sales people are scripted.” So have a script, follow the script. Don’t try to wing it. There isn’t 2,500 different ways to sell something. So have a script and follow your script at the beginning of the lead generation process. [0:25:04.9] Brad: So, setting on appointments with them. [0:25:08] Mark: Set on many appointments with them and observe best practices. Like for example, Ron Carson is an industry leader. Imagine going on 20 appointments with Ron Carson. By the end of 20, you’re going to have the process. You’re going to learn the type of questions that you ask. It’s not going to be different. You’re not going to see 20 different meetings. You’re going to see a style. And everyone needs to adapt to their own style. But in whatever we want to do in life, the people who are most successful have a consistent process. [0:25:42] Brad: Process is the key. It’s funny. The two calls I did today, sell process not product. When you sell product, you’re a commodity. And when it comes down to the process, that’s where you differentiate. And obviously, Ron’s one of the best in doing that. So let’s keep rolling on we work like halfway through your questions, so we got to the “what do you have to do if we continue on that framework, what could get in the way?” You want to just continue through those questions, maybe why those four questions? You’ve got four questions in your book. How did it become that or how those become to be? [0:26:15] Mark: Well, let me go back, so it’s really simple, right? If you don’t know what you want, I promise you won’t get there. So if you’re really clear on what you want, then you can determine what do I need to do to get what I want? And I like the crystal ball exercise which is one page, two questions, that basically says this: you wake up, it’s the end of 2017, you’re celebrating big because you achieved what? So whatever your goal is, you’ve achieved it. You’re thinking ahead, right? So then, what are the top three, four, five specific and measurable activities – keep in mind the word “activities” is actionable – what are the specific and measurable activities that will lead me to the outcome that I want? So I like that because it’s very clear. If you can’t define it, you can’t measure it. If you can’t measure it, you can’t manage it. So I like having a very clear plan. Now, stuff is going to get in the way. For a lot of firms, it might be people. Do I have the right people to help me do that? Maybe it’s me. What blind spots do I have that might get in my way? Am I one of those people that’s always chasing shiny new objects? Am I one of those people that’s easily distracted and I don’t follow my plan? That’s why I like question four about accountability because imagine if every business had to walk in, if every advisor had to walk in, and on the whiteboard, and all the advisors that I work with, I want them to post out whiteboard or have it on the computer screen, so we have all the measurability by person, even the CEO, if you’ve committed “x” in units, remember, specific and measurable, how many units did you say you’d get done this month? That might be calls, seminars, prospect meetings, client meetings, have it all measured out, and it’s either you did it or you didn’t. So the scoreboard, I love, because it highlights that for all to see. And look, it also sets the tone for the owner of the business because they need to be accountable too. They want to set a good example, not a bad example. [0:28:42] Brad: Well, what’s interesting in our industry, and you’ve coached financial advisors, I’m sure you’ve run into this. And this is not picking on financial advisors. It’s people in general who like to set goals this way. And if it’s a revenue of $500,000 last year, this year I want to get to a million. They’re these big, fluffy numbers. They are specific, but it’s what you’re breaking this down into what is that weekly activity that I’m performing that gets me to the finish line here, not the, “I’m just going to double my revenue this year” without specific, measurable things that actually gets you to the finish line. [0:29:16] Mark: Any advisor can get from X to Y, half a million to a million, it’s a numeric exercise. Work backwards, what do I need to do to get from X – we’ll call it 500 to a million? And then, determine what those activities are that will guarantee you to get that done, work backwards and you do the, whether calls, seminars, meetings, dinners, whatever it is the activities, you follow your plan. If you miss, it’s because you set the wrong assumptions. Let me give you another example and I’m really going to go out on a limb here. I’m a decent athlete, however, at 52, I’ve decided that I’m going to run a marathon in 2 hours and 59 minutes. There isn’t one of my friends that believes I can do this. Well, there are not a lot of people over 50 run in a marathon in 2 hours, 59 minutes. By the way, that’s 6.52 pace, so you’re moving. For a lot of people, that’d be fast for one mile. For 26.2, that’s pretty quick. But I know – I was at the track last night with my coach who’s 59 – I know the activities that will lead me to the outcome that I want. And I know despite what everybody else around me thinks, I know that if I’m willing to do the activities, I will achieve my goal in Berlin, September 24th of this year. [0:30:47] Brad: Sounds pretty specific and measurable. [0:30:49] Mark: Absolutely. You can hold me accountable to that, pal. [0:30:53] Brad: It’s now on the public domain, buddy. You better live up to that one. [0:30:57] Mark: So I was writing the book, it was in my mind. And I think this is the first time I’ve actually, this is like really putting it out there, I know it’s now live. It wasn’t in the book but I actually, I have been speaking about it. And when I go out and do conferences, it’s out there. I know if I put it out there, I’m committed to, and I am. [0:31:19] Brad: I love it. That’s why you’ve run 12 triathlons. You don’t do that without committing. [0:31:24] Brad: So while we’re on the topic, let’s just segue off into the sports realm. I used to play football, so sports has been a big part of my life. You’ve run 12 triathlons. What sort of craziness leads you to do that? And I do mean respect. [0:31:38] Mark: Let’s not get confused about the word “triathlon.” These are Ironman. And triathlons come in all kinds of distances. So an Ironman is 2.4-mile swim, 112 bike ride, and then you get to run a 26.2-mile marathon when you’re done the first two events. That’s a big effort. How I got into that was my son had a brain tumor. And he survive that brain tumor. And I wanted to thank the hospital by raising a bunch of money for the hospital to say, “Thanks for saving my kid’s life.” And I decided to sign up. I just, the year he had this tumor, it was 2004. I had just started doing the little sprint triathlons, the hour and a half little races, so that’s how long it took me. I was pulling up the rear at the time. And I decided later that year I was going to prepare, hire a coach, and do an ironman. And in 2006, I completed my first ironman. It was a big effort. But once I decided I was going to do it and hire the coach, who laid out a plan for me, and he held me accountable with that plan, I got that thing done. [0:32:52] Brad: That’s inspiring. I didn’t know that backstory to your first one. Did you raise a lot of money? [0:32:57] Mark: I did. The first one, my goal was to raise $100,000, I raised $110,000. And since that time, I’ve raised over half a million for the Children’s Hospital of Orange County. [0:33:08] Brad: Wow. That’s awesome. [0:33:09] Mark: I got a whole bunch of my buddies, CEO friends, involved with the hospital. And they’re now doing what they can to make a difference to. So it’s not only what I did but inspiring what others could do to. Even my kids, my son, Mason, who had the brain tumor, he and my daughter raised $3,500 by setting up a little lemonade stand. They recognized they’d get more money rather than doing it in the neighborhood, they went down to the grocery store and set it up. They’d make more money. And the grocery store supplied all the lemonade. So there’s more margin in it, so smart thinking. And then he set up a little site, and then raised another $4,000 online around an event that he was doing. So it is doable if you believe that you can. [0:33:55] Brad: Yeah, sounds like you have some future entrepreneurs on your hands. [0:33:58] Mark: I hope so. [0:33:59] Brad: Yeah, for sure. So what’s the biggest lesson the triathlon has taught you, whether it’s a life lesson or a business lesson? [0:34:07] Mark: I believe this: if you believe you can, you’re right. If you believe you can’t, you’re also right. And I learned that lesson. But that’s what Henry Ford used to say. And I try and inspire my kids to believe that. And I’ll give you an example. My daughter last year was 16. And she’s a rower. And she was going out for a competition and she said, “Hey, dad. Today, I’m going to go out there. We’re going to play second.” I said, “Second? Oh, congratulations and it’s great. Just curious, how come it’s not first? I’ve never heard anybody aspired to be second.” And she said, “Well, the other team is just too good. We can’t win.” “Hey, listen, if you believe you can, you’re right. If you believe you can’t, you’re also right.” “Hey, dad, don’t give me any of that coaching stuff. I’m not interested.” I said, “Why don’t you try this: you go down inspire your teammates, the eight other gals. You inspire them and say “today’s our day. Today we can win. If we believe we can win, today we will win.” That day, they won. Believe you can, you’re right. I tried the same methodology with Ironman. And in an Ironman, if you go under 12 hours, that’s pretty awesome. If you go under 11 hours, that’s really cool. You’re starting to move into real elite. And I set up that same methodology, determine what I wanted, hired a coach, built a plan, held myself accountable, and in 2011, I went 10 hours, 56 minutes, and ended up winning my division at the race, by believing that I could. You get what you intend. I keep learning that. My clients keep learning that. My friends keep learning that. You get what you intend. I even got my kids to be believers in that even though they don’t like to believe what dad says. [0:36:06] Mark: That’s right. Well, the key to that is if you ask the right questions and you can help them make it believe it’s their idea, by just directing them with the right questions, you’ll ultimately, if they can get to a place where they believe and buy in that it was their idea, they’re much more likely to achieve it. [0:36:31] Mark: It’s the same in the world of coaching CEOs. I may know the answer. I come in and tell them what the answer is because I’ve walked down that road a whole bunch of times. They don’t own it. If I lead them and guide them to make it their idea, they own it. They’re much higher likelihood of achieving it. [0:36:47] Brad: The same thing implies to financial advisors trying to bring clients on. If you tell somebody what they should do, it’s just you trying to sell them or you give them your advice as opposed to asking them the questions that lead them where they want to go. I think it applies to a lot of different businesses. So this really inspired me. I don’t think I told you this but on the first introduction, Ron Carson introduced us and you were on some continent. I don’t even remember which one. And it seemed like there were a couple of texts we were trying to set up this call here, this podcast, and it seemed like each text came from a different continent that you’re on. And that’s really inspiring to me because you’ve got a guy that you’re driven, you’re successful, you’re running the business, and I think one thing that a lot of our top achievers, financial advisers struggle with is that whole work-life balance. And it sounds like you struggled it with when you were young and running the painting business. So tips, tricks, you have keys that kind of unlock this where I can be a high achiever from a business standpoint but I still have this ability to go travel with my family, and you do some really cool trips with your kids. I’d love to talk about that too, but I’ll just let you run with that. [0:37:55] Mark: OK. I’m going to make a couple of comments. Firstly, it’s with my book, “Make Big Happen: How to Live, Work and Give Big,” OK? It’s not all about work, work, work, work. It’s, “We work because it’s arguably fun. We’re doing something we’re very passionate about.” But we want to live the life that we really want. So this is what I recommend: put all the important stuff in the calendar first that you want to do. So I have races all the time all over the world. I get all this travel with my wife. I got the one-on-ones with each of the kids. I take my dad. This year, I’m taking my mom to the US Open in New York. I took my dad last year for two weeks in Eastern Europe at 85 years old. And put that stuff in the calendar first. Hey, look, we’re doing this webinar here in the afternoon. You’d never get me in the morning because I’m at the gym. Nothing gets in the way of me going to the gym. I go every day. I never do a call in the mornings because I’m at the gym early morning every day. So plan the important stuff that’s important to you first, build that into your calendar. And then build the other stuff around it. Additionally, what I’ve learned is if you find yourself continuing to have to do, do, do, be the person that’s doing. You’re not leading and growing a business, make sure you have the very best people in the roles that they ought to be in so you can focus on your highest and best use. [0:39:32] Brad: You just reminded me of a quote from my buddy, Michael Hyatt, “It’s not a big enough dream if it doesn’t require a team.” I love that. And I think that’s a battle as well in the financial advisory space. It’s like, I don’t want to complicate my life because a lot of people look at hiring staff and leading a staff. And all of that, that comes along with it, is complication. But if you do it right and hire the right people as you stated earlier, Mark, it doesn’t necessarily have to be a complication, right? [0:40:00] Mark: Let me make this comment: if you don’t have an assistant, you are an assistant. [0:40:07] Brad: I like that, very direct. [0:40:08] Mark: Well, it is. It’s true. If you are doing work that’s $10 to $15, $20 an hour work, that’s your wage. Hire somebody that can do that stuff for you. Now, you got leverage. If you took all that time and you spent that time prospecting or surveying or servicing your clients, your firm and you are way better off. [0:40:34] Brad: So going back to work-life balance, the intentionality of the trips with your parents, which I didn’t know about, and you also take a trip a year with each of your children, is that right? [0:40:46] Brad: And is that one-on-one, just you and them, or how’s that structured? [0:40:51] Mark: It’s one-on-one. We’ve been doing it since my kids were one. And it’s been an amazing experience. We’ve done such neat things. As the kids get older, the activities get stepped up. I’ll share one experience that we did a few years ago with my son. We went to the Ice Hotel in Quebec City. We slept in the Ice Hotel for a night. It’s amazing sleeping in a hotel made of ice. It was cold, yes. We went dog sledding. We went sledding down the mountain. It was just the most amazing experience to go get to do something like that and share that. We still talk and we rolled the dog sled. I fell off the back. He was still in it. He rolled. He’s all full of snow. He still tells me I’m a horrible dog sled driver. We still laugh about it and probably it’s true. I just never had a lot of experience at running dogs. But it’s one of those experience that was great. My daughter and I did a white water rafting trip that was white water rafting, zip lining, riding down the mountain in Beaver Creek on mountain bikes, it’s just fun stuff. And it’s something that if you put it in your calendar, it will happen. If you don’t put it in your calendar and you say “I’ll get to it.” It likely won’t happen because something else will always take priority. [0:42:24] Mark: What part specifically? [0:42:26] Brad: Well, I get to put in the calendar. Is it a set amount of time? Is it a set time of year each year? Does your child pick where you go? What’s the framework to actually make it happen? [0:42:37] Mark: Yeah, that’s a good question. So we do one trip a year. Look, when my daughter was one, it was just an overnight. We went down to SeaWorld. As they got older, last year, it was a week in Central Bay in Paris. So that might be a little extreme. That was the most extreme thing we did. But we typically run for three nights. But they don’t need to. IT could be two nights. But it’s just getting away the two of you guys doing something that you guys will enjoy doing together. It might even be having a ritual on Sunday mornings. You make pancakes together. Whatever it is that gives you that opportunity to do what you really want that really matters to you. My wife and I, Saturday nights, that’s our night. We go to dinner every Saturday night. Sunday nights, we do a family meeting every Sunday night with the family. And we take turns. We rotate the family meeting. It’s typically three or four questions. And whoever is running the family meeting gets to ask those questions that time. Any questions that they want to ask, or any little exercise that they want to have the family answer, January 1 is when our goals are due. And every member of the family presents how they did on the prior year goals and presents the new goals for the year. [0:44:00] Brad: How old were your children when they set their first goals? [0:44:03] Brad: Six? Wow. That’s impressive. [0:44:06] Mark: But, look, it doesn’t need to be something big, like I know my kids put on their goals every year, go on our one-on-one trip with dad. So wherever the trip is that particular year. This past year, my son and I went to New York City. It was his first time. And we did all kinds of cool stuff. We went for five days. It was an amazing time. It’s a matter of prioritizing what really matters to you. I remember it was Johnny Carson many years ago, where I got this from. He would take one week a month off. I think it was what it was. I started taking a week a quarter with my wife, where we would go away and do something just the two of us. We’ve been doing this since our kids were really young because it was good for us. It was good for our marriage. It was healthy. IT was fun. And today, we’re probably eight weeks a year, the two of us, traveling somewhere. It’s an amazing experience that we get to have together. [0:45:03] Brad: That’s awesome. You’re inspiring me. My six-year-old is going to set goals now. [0:45:09] Brad: My wife and I actually, we’re talking about it. And I was trying to think of how do you keep it simple enough where they actually do it. So we’re still working through that. If you’ve got any tips after this, shoot me a text or something. So I want to respect your time. I know we just got a handful of minutes left here, Mark. This has been awesome. If you’re good, we’ll flip into kind of rapid fire on the questions here to wrap up. [0:45:29] Brad: Awesome. All right. When you hear the word “successful,” who’s the first person that pops in your mind and why? [0:45:35] Mark: Richard Branson because he’s doing exactly what he wants to do. And I love his quote that “you can’t differentiate between work and play. It’s all one and the same.” And I love that. He’s pursuing his passion. And I would say Steve Jobs would have been another guy that he, too, was pursuing his passion, even as sick as he was. Warren Buffett’s another one. These guys are living their passion. It doesn’t feel like work to them. They can’t differentiate between the two, and I think that’s true success. [0:46:10] Brad: I think you’ve got some Richard Branson going on in your business. I thought it was cool when Ron was telling me how you do the Rim-to-Rim. And you know it’s there. It’s a fun activity shared with friends. but at the same time, you know there’s some fun business conversations going on along the way too. So it’s cool when you can combine the two. [0:46:28] Brad: All right. Let’s get to what’s the favorite book you’ve ever read and how did it impact your life? [0:46:34] Mark: Well, there have been many books. I read a lot. I read 24 books last year. I actually do them on Audible because I like to do it when I’m running. I’m multitasking. I really like that. I really loved “Exponential Organizations” by Salim Ismail. It’s just a completely different way of thinking about where the world’s going and leveraging the sharing economy. And rather than building a linear business like financial advisors do one at a time, “I do X, I get Y,” it’s “I do X, I get 10 Y as I go with 10 X.” So I really like that one. When I was young, in my early 20s, I read a book it was called “If It Ain’t Broke, Break It.” And in the book – it was really impactful to me – because in the book it asks me a series of questions. And I didn’t read the book probably for another 15 years later. And I had forgotten what I’ve written in the book in my own handwriting. And one of the questions was about what I wanted. And I wrote down, “Win the US Squash Championship.” It’s funny. Two years later, I did. I wrote something else down. I wanted to do international business. Today, I do international business. Wouldn’t it be cool if I could speak all over the world and people would actually listen? I’ve gotten to do that now hundreds of times. So it’s amazing. It had a real big impact, that power of writing it down, and even though I forgot that I’d written it down in that book in my 20s. [0:48:11] Brad: Yeah. That’s cool. Is there a book along those same lines that you’ve gifted a lot to either clients or friends? [0:48:17] Mark: I like – and this is a good book for I think the financial services business. I give this book away a lot – it’s “Getting Naked” by Patrick Lencioni. And it’s really about just, I like Lencioni’s style and the way he writes fairy tales. But it’s about just giving stuff away for free and just keep working for your prospective client, and eventually, there’ll be a client. [0:48:43] Brad: I haven’t read that by him. I do like him a lot, though. [0:48:45] Mark: I think you’ll like the book a lot. It’s got some very compelling points in it. [0:48:49] Brad: All right. Down to two minutes. Two-minute warning here. We’ve already asked a piece of this. So I kind of ask you the advice that you would give your 20-year-old self. Let’s go to Mark, 28-year-old Mark that just started his mortgage business up. Any advice that would differ for you at that age as opposed to young Mark, the painting company guy? [0:49:11] Mark: Hire the best people, the best people you can. You can always hire better people than you think if you inspire them with their vision. That’s the advice I’d give me. That’s the advice I give any friend about leadership or business. Hire people that are better than you. Empower them and get out of their way. [0:49:34] Brad: I want to piggyback on that because I give the same advice a lot. And this goes back to the CEO, right? Telling the CEO what they should do as opposed to letting them find their way there. What do you do to convince someone that knows they need to do it, but then they see the price tag that’s really expensive to hire great people, and that blocks them. They’ve got a mind block where they can’t get past it? How do you help them? [0:49:55] Mark: OK. This might be a little longer answer than we have time for, but I’ll give you just a little preamble to it. This is a common, common issue that we see in the coaching all the time, whether it’s hiring a sales person in the wealth management business, possibly hiring another advisor or two, it’s all about a math exercise. So you bring this person on board. What’s the impact 12 months from now on your P&L? And, usually, the impact is real, really meaningful. So they’re just talking about short-term pain, three to six months pain. In some cases, it might be a year pain. But the benefit so outweighs that pain. You need to find a way to make it happen. [0:50:39] Brad: Awesome, my friend. Well, we’re right at 4:30. So I will let you run. And thank you so much, Mark. This has been a blast. I appreciate it. [0:50:47] Mark: Yeah, I can’t believe how fast it went. Look forward to being with you again. [0:50:51] Brad: All right. We’ll do the Grand Canyon sometime. [0:50:53] Mark: That would be fun. [0:50:54] Brad: All right. We’ll see you, Mark. Take care. [0:50:55] Mark: OK. See you, Brad. Bye. The information and opinions contained herein are provided by third parties and have been obtained from sources believed to be reliable, but accuracy and completeness cannot be guaranteed by Advisors Excel. The guest speaker is not affiliated with or sponsored by Advisors Excel. Results from the use of these concepts are no guarantee of your future success. While client appreciation events may be permitted, such event should be reasonable and customary. All producers and investment advisors should be aware of any gifting limitations imposed by federal regulation, state regulation, insurance carriers, broker-dealers and Registered Investment Advisors, as applicable. Investment advisors are strongly encouraged to obtain pre-approval from the broker-dealer and/or Registered Investment Advisor with which they may be affiliated prior to implementing the concepts or strategies discussed in this interview. Positioning yourself as a celebrity is not a substitute for professional credibility, nor should it be viewed as a shortcut for obtaining new clients. Rather, it is a system of branding and marketing designed to help reinforce your credibility and value proposition. Credibility is founded in knowledge and experience.